Inventory We are a resale marketplace, not a box office or venue. Ticket prices may exceed face value. This site is not owned by San Digo County Credit Union Stadium . San Digo County Credit Union Stadium a.k.a. The Q, The Murph, formerly known as San Diego Stadium, Qualcomm Stadium, and Jack Murphy Stadium, is a multi-purpose stadium in San Diego, California. It was the home of the San Diego Chargers of the National Football League and of the San Diego State University Aztecs college football team. It hosts the Pacific Life Holiday Bowl and the San Diego County Credit Union Poinsettia Bowl college football games every December. Until 2003, it served as the home of San Diego Padres of Major League Baseball. The stadium has hosted three Super Bowl games: Super Bowl XXII in 1988, Super Bowl XXXII in 1998, and Super Bowl XXXVII in 2003. It has also hosted the 1978 and 1992 Major League Baseball All-Star Games, the 1996 and 1998 National League Division Series, the 1984 and 1998 National League Championship Series, and the 1984 and 1998 World Series. It is the only stadium ever to host both the Super Bowl and the World Series in the same year (1998). It is one of three stadiums to host all three events, along with the Hubert H. Humphrey Metrodome in Minneapolis and Los Angeles Memorial Coliseum. 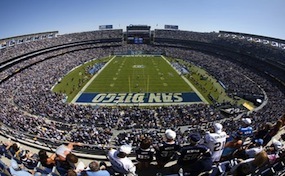 StadiumSanDiego.com is not affiliated with any primary box office or supplier. We are a privately owned and operated business specializing in sales in the secondary market. To buy tickets for any San Digo County Credit Union Stadium events in San Diego simply click on the event of interest or call our operators at anytime.